Manchester covers around 45 square miles and is seen by many as the capital of the north of England. Today over 450,000 people live in the city, while the Greater Manchester Urban Area has a population in excess of 2.2 million. Those living in Manchester are known as 'Mancunians'. The official language is English and the currency in use is the Pound Sterling (GBP). Tell me about one of Manchester's top attractions? Old Trafford is without a doubt one of the most popular sights in Manchester. Well, for one thing, it's the home of Manchester United, one of the top soccer clubs in the world. Here you can visit the museum and see some of the trophies won throughout this club's illustrious history. You can also take a tour of the stadium, from the players' dressing room to the manager's spot on the sideline of the pitch. Anything else which shouldn't be missed? There's a lot to see in Manchester, and one of the best places to get a good overall look of the city is from the Manchester Wheel. Stretching 60 metres high and offering 42 capsules, this big wheel is a great way of seeing the city a little differently. 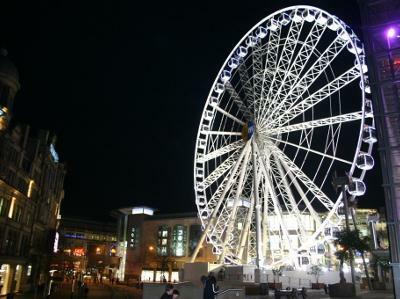 Especially enjoyable at night with it's lit up; the wheel offers stunning views of the city spread out below. Check out the Imperial War Museum North down at the Quays. An interesting and moving museum, here you'll learn the stories of many different people whose lives have been touched by war in one way or another. Housed in an award-winning building, the displays here include everything from art to artillery. Visit the Museum of Science and Industry (MOSI) on Liverpool Road, which is housed in five listed buildings that include 15 different galleries. Here you can have a look at everything from a replica of a Victorian sewer to the first all-British aeroplane. For a bit of fun, have a go at one of the many interactive exhibits in the Xperiment area of the museum. On average how much does it cost to get into Manchester's top museums? They're free! That's right. Many of Manchester's top museum and art galleries don't charge an admission free. These include the Manchester Art Gallery with its collection of around 25,000 works of art, the Manchester Museum which is home to Egyptian mummies, live frogs, and a giant T-Rex, the Whitworth Art Gallery where you'll see lots of interesting contemporary art, and the John Ryland's Library which boasts a fascinating collection of old books under its the vaulted ceilings. That's great! But say I do want to spend some money. Where should I go? Well, you won't be short of shopping opportunities while in Manchester, that's for sure! Everywhere you look you'll see stores of all kinds. 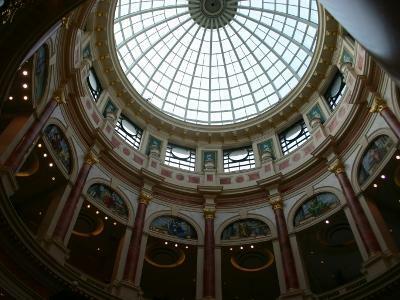 Well-known brands are prominent on Market Street and in shopping centres such as the centrally-located Manchester Arndale and Triangle centres, as well as at the sprawling Trafford Centre, which is located around 20 minutes outside the city. For something a bit different, be sure to head to Affleck's in the Northern Quarter. Spread out over 4 floors, this collection of indoor independent stalls is the place to go for alternative shopping in Manchester. Its vibrant nightlife is one of the things that make Manchester such a popular spot. Down along Oxford Road, which is where most of the city's large student population can be found, there's a large number of bars and clubs to choose from. Up in the Northern Quarter, with its bohemian atmosphere and abundance of record stores, you'll come across some of the best nightspots in the city. Many of these offer you the chance to experience Manchester's renowned live music scene. In the area around Exchange Square and in Petersfield, you'll also find a selection of popular bars and clubs. It's generally a good idea to have some ID with you, as some places have bouncers on the door. For somewhere to have a few drinks and then dance the night away, head to Revolution on Oxford Road. This venue stretches over two levels: a downstairs bar and an upstairs area which opens up on Wednesdays for Student Night, as well as at the weekends. Downstairs the atmosphere is a bit more chilled, with lots of booths and tables where you can sip a beer or cocktail to an indie rock soundtrack. Once you've had a few, you can make your way upstairs to cheesy music and a large dance floor. The Night & Day Café on Oldham Street is a really comfortable bar and is one of the best places in Manchester to catch live music. From one of the many tables in the long bar area, you can watch the stage or just sit and enjoy the beers, spirits, shooters and cocktails all offered here. The drinks and food menus are written up behind the bar on a series of chalkboards behind the candle strewn bar. This alternative stalwart has very friendly staff. Aspiring musicians take note, if you drop in a CD or MP3 you too might spend a night on the stage here. Take a trip to the South Pacific at Keko Moku on High Street. This cocktail den might be tiny but it's a top spot, boasting a huge selection of reasonably priced cocktails. It's pretty interesting inside too, from the Tiki cocktails to the rug covered alcove for canoodling couples. The bar itself is a treat too, with lots of bamboo and twinkling lights. Manchester also serves up a wide variety of treats for culture vultures every night. The Bridgewater Hall on Lower Mosley Street is this city's international concert venue and is particularly popular as a classical music venue. It is home to 3 different orchestras including the BBC Philharmonic and hosts a classical music season each year. Rock shows, jazz concerts and world music performances also take place here. Is it expensive to eat out in Manchester? Thanks to the number of restaurants offering meal deals, set menus and specials you'll always be able to find a reasonably priced meal in Manchester. There are a huge number of restaurants to be found all over the city, from the Northern Quarter to the Salford Quays, offering everything from a quick sandwich to traditional British favourites such as bangers and mash. They are! Manchester, with the UK's second largest Chinese community, has its own Chinatown. Here you'll find lots of different Asian cuisine and many of the restaurants offer great buffet deals. There's also the Curry Mile. This is a long stretch of Wilmslow Road, which is a continuation of Oxford Road. Neon-bright curry houses, Indian takeaways and Middle Eastern restaurants line both sides of the street. Other types of cuisine are well-represented in Manchester too, including Italian and Mexican. Sure! If you're looking for a good, old-fashioned English breakfast you could check out Café Gio on Princess Street. It offers fry-ups at great prices, as well as sandwiches, jacket potatoes and soups. This café is around the corner from the Manchester Art Gallery and other attractions, so it's a good spot to start a day of sightseeing. If you need a coffee break, stop into Coffee Republic on Oldham Street in the Northern Quarter. You can relax with a coffee in one of the comfortable armchairs by the big window at the front of the store or set up your laptop at one of the many tables and take advantage of the free WiFi on offer here. As well as a large range of hot drinks, the menu also features juices, smoothies, pastries, cakes and sandwiches on the menu. For dinner, Dough on High Street is a great choice. From a choice of pasta dishes and salads to a huge selection of pizzas, including gluten and dairy free options, this large Italian restaurant is a great place to check out if you’re looking for substantial portions at low prices. Relax in the chic yet comfortable interior and enjoy the fast, friendly service and tasty food. Lots of restaurants in the city, particularly those along the Curry Mile, stay open until the wee hours of the morning. For some of the best fresh foods in the UK, head to Bury Market, which is about 25 minutes from the city centre. There's a huge selection of food on offer here, including seafood, meats, cheeses, fruits, vegetables and more. How many different modes of public transport are there in Manchester? Quite a few! Manchester has a pretty extensive public transport system, so getting around shouldn't be a problem. The free Metroshuttle bus service runs on three routes covering most of the city centre. It operates on Monday to Saturday from 7am-7pm and on Sunday from 10am-6pm. Then there's the Manchester Metrolink, which runs on two lines passing close to lots of the main attractions. Taxis are available across the city too. These include both the unmistakable 'black cabs' and cars from private hire taxi companies. Well, it's quite possible to make it to many of the main attractions around the city centre on foot. However, if you want to head out a little further and see places like Old Trafford or the Bury market, you'll need to use public transport.